This unit is treated as a Vehicle for stacking purposes. This unit’s long range against Vehicles is 5–20 hexes. This unit gets –1 on cover rolls. 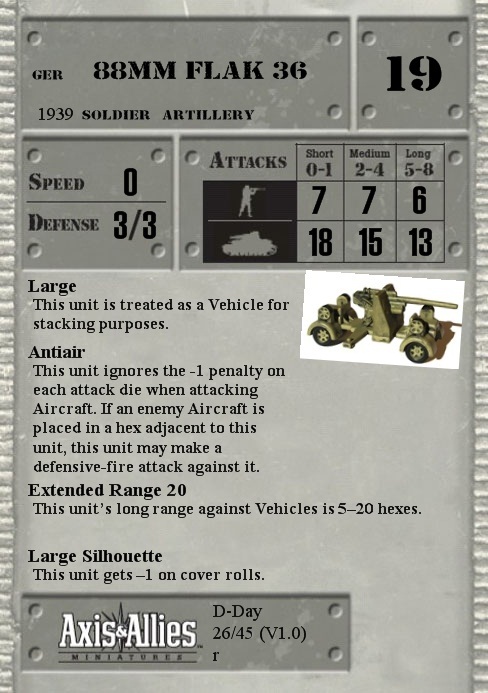 Q: How can I load up a German 88 Flak Gun with the Large SA if only one vehicle per hex is allowed? A: The current stacking rules allow you to temporarily over stack the hex. Using a transport with the Large Transport SA, you can drive in and then load up the 88 Flak Gun. Once the gun is loaded, it no longer counts towards the stacking limit within the hex. Q: German Flak 88 w/shield just says Extended Range 20 versus the North Africa 88 which has Extended Range 20 for vehicles only. Which is it? "Extended Range 20 - This unit's long range against Vehicles is 5-0 hexes."